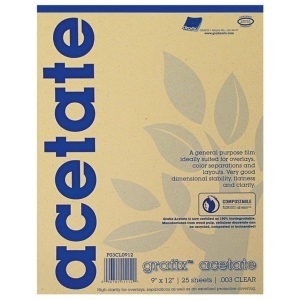 Grafix® acetate has been certified as 100% biodegradable in the U.S. and Europe. * This cellulose diacetate film which is made from wood pulp can be recycled composted or incinerated. * Biodegradable seal on package. * Use this general purpose film for overlays color separations and layouts. * 25-sheet pad .005" thick.